In pursuit of the 2lber, I met up with Phil K for a day on some old gravel pits we know half way up the M6 towards Lancaster. Though the temperature was warmish (12 degrees) the wind chill saw us shivering by lunchtime so we called it a day quite early on. I had an 8 ouncer on caster first cast, but then had to wait til just as we were packing up before I could get another bite. Phil used waggler red naggots and had a few nice roach to 1lb 8oz, and also a new personal best tench of 5lb 11oz – well done that man! Its a carp lake that has a good head of coarse fish which are generally considered a nuicance by the locals – I’ll be back hopefully on Saturday. I cleaned out one of my three fishing boxes this evening – note to self – stop buying hooks everytime I visit the tackle shop. As I’ve been suffering recently with a bad chest – I didnt really fancy todays planned fishing trip with the lads on the River, so managed to persuade them that the trout would be obliging at Pendle View Fishery. I’ve fished this water on and off for a number of years – its probably the easiest place to catch rainbows in the area, and they succumb on a regular basis to all tactics. Easy fishing, just whats needed when your all bunged up and only want an hour or two out of the house. I set up using an elk hair caddis – even though it was cold and bright as the fish here seem to take off the surface no matter what the conditions. But i had no luck, and it wasnt until I swapped over to a white and chartreuse cats whisker that the fish took any interest in what i had to offer. I tried quite a few lures, even this old Salmon fly which has sat in my box for years and never been used. (it went back in after a dozen casts). Plucks, swirls then the pull of a fish – a great couple of hours. The scenery was better than the fishing though with dozens of parasailers taking advantage of the conditions over Pendle Hill. Though we all caught – the lake didnt live up to its usual high number of fish – probably because there were nearly a dozen anglers thrashing the water on the small lake. It always seems to fish best when theres only a few on. Great weather, great company, and an enjoyable couple of hours fishing. For anyone who is thinking of giving this place a try – dont bother with the Salmon flies – i was only messing about seeing what i could dig out of the depths of my fly box, trying something silly to see if it would work. We usually use buzzers, spiders and small floating beetles on here for best results – resorting to lures if the fishing is slow. A new venue – which is local to me and reputed to hold BIG roach. I’ve been meaning to get up there for a few weeks now to have a reccie but havent been able to find the time. So I had a few hours free this afternoon so Paul and I decided to give it a go. The weather was far from ideal for roach fishing – bright sunshine – a strong gusting cold wind – interspersed with hail showers and to end the day off a real downpour. After intially struggling to get presentation right in the gusting wind, we both finally started to get bites and were rewarded with a couple of 2oz roach – not the 2lbers we were after, but its a start, and it gives us a better idea of the tactics we might use in the future. Brrrr that wind was cold. 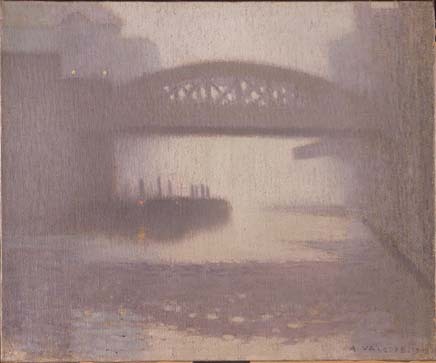 Pierre Adolphe Valette was a French impressionist artist who came to live in Manchester in 1905. 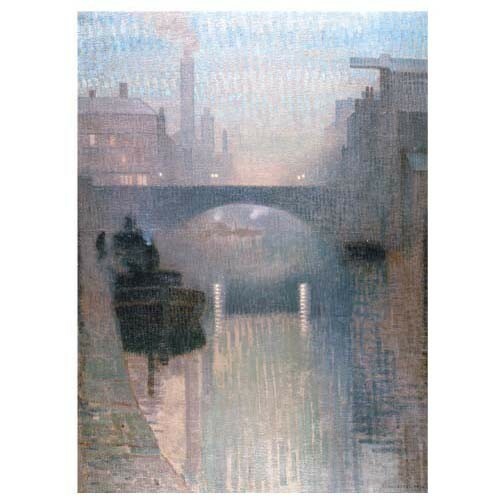 Finding our murky grey landscape to his liking – he stayed in the North West until 1928 painting many Manchester landscapes in the Impressionist style. He became a tutor at the Manchester Municipal School of Art and was mentor to L.S. Lowry. Adolphe painted many pictures of the Irwell in the impressionist style – today I did a good impression of an angler – and caught bugger all. Not my research – but the recently completed study by the fantastic people at http://www.substance.coop/ in Manchester. I had a few hours free this afternoon, so I defrosted a few dead baits and headed off towards the Irwell at Agecroft. The river was still running high and fast so I decided to have a few casts on “The Pit”. “The Pit” is one of Greater Manchesters few gravel pits, dug in the late 1960s to provide gravel for the building of the local motorway network. Its not too far from home, but saying that its not an easy water is the understatement of the year. Its home to some massive carp, tench, bream and pike but their numbers as you would expect are very low. People have been known to fish the place for a season only to be rewarded with one or two bites – however the quality of the fish make these bites worth the wait. So i mounted a roach and cast around for an hour or so without a touch. I like wobbling dead roach, I think its far more effective method lures as Paul and I have proved to each other over the last 12 months. Ah well today it wasnt to be, the wind chill and frequent horizontal rain showers eventually saw me off. The windward end of “the pit” – possibly a heart breaking hole in the ground – or if I’m lucky it might give up a couple of its gems. I spent a very windy afternoon at Church Gardens in Bolton fishing hemp and caster for the lovely roach which are present in large numbers. The wind was so strong that i couldnt hold anything more than 7m of pole and even at that length I found it difficult to hold the bait still. Nothing for the first 15 minutes, but once the roach got a whif of the hemp I had a steady stream of bites all afternoon long from roach between 6 and 12oz with most of them coming 6 inches off the deck. Great fun, and I reckon that it will be a great roach venue in the summer months when the fish are up in the water. Only a couple of others were fishing, (sensibly on the tip) and they were catching small mirror carp on pellets. How big the roach go – I dont know, anyone know if this water holds a 2lber? Angling, fishing, you can call it what you like but as we all know – its not called catching. We all get something different from our sport – its a fantastic way to be involved in some collective individualism. I had a great time out fishng today – I didn’t catch anything but took more pleasure than I would have recieved by catching something myself by watching others catch – and enjoy themselves fishing. Have a look at Toms Blog and Nicks Blog and the Salford Friendly Blog for the full write up of todays trip out. Flecks of gold dust – just like the eye make up on this pike which has survived a recent catastrophic pollution incident. For the last couple of years I’ve done a little rod race with a few pals to see who can catch the highest number of freshwater species in 12 months. In 2010 I had 24 species, and last year 30. I could have easily had 34 last year but by the time September came I was thoroughly fed up with the whole process as i seemed to catch nothing but tiddlers. Whilst it was initially good fun, I eventually realised that I was missing out on the bigger specimen fish which really give me a buzz. So in 2012 I’ve decided to turn my attention to nabbing a few lunkers. 20lb Carp, 20lb Pike, 10lb Barbel, 2lb Roach, 7lb Tench (a big fish for the northwest) and a 10lb bream are my targets for 2012. I know venues where these fish can be found, catching them will be a different kettle of fish.